Join Bob Vila, noted home renovation and repair guru, Thursday, June 30, 2011 at 10 a.m. Pacific time/1 p.m. Eastern time on a Twitter chat on home exteriors. VinylSidingZone.com and other experts will participate in Bob Vila's chat. Topics will include siding, paints, stains, and renovations. It will be a great opportunity for anyone interested in making improvements to their home exterior to join in the chat by using the Twitter hashtag #GetReadyThurs. You can follow the chat by going to both http://twitter.com/#!/bobvila and http://twitter.com/#!/vinylsidingzone and selecting the +Follow buttons on each. Remodeling Magazine's 2009-2010 survey of remodeling projects show that when considering return on investment (ROI), seven of the top ten projects involved exterior improvements. The report also broke down improvement projects by region, and replacing home siding was a top-rated project in almost every part of the country. But which siding type is best in your neck of the woods? Remodeling Magazine found that vinyl siding replacement was a top choice for lower-budget renovations. These projects typically cost less than $15,000 and returned an average of just over 80% of their cost. Lower budget projects are popular in the current economic environment, and most upscale renovations ranked well down the list for ROI. However, fiber-cement siding cost versus benefit was the notable exception, with an ROI of 83.6 percent, placing it in second place overall in the survey and above vinyl siding. Fiber cement siding prices run about $1 per square foot more than vinyl siding costs. Fiber cement siding costs up to $2.50 per square foot less than wood siding, up to $11 per square foot less than brick siding, and as much as $26 per square foot less than natural stone siding. In addition to a potentially healthy return on investment when you sell your property, siding replacement may net you some savings on homeowner's insurance or local tax breaks. This depends on what kind of siding you are replacing, if the replacement is considered energy-saving or green, and what hazards (fire? termites?) are common to your area. In Maryland, for example, improvements considered energy-saving (like adding insulation) can get you up to $1,500 in tax credits. And while fire-resistant siding may lower your fire insurance bill, it might increase overall cost in other ways. Replacing siding could increase your home's value, according to insurance expert Ryan Hurlbert, which could lead to a slightly more expensive policy. "It's hard to make a statement that applies nationally; if there are discounts or tax credits, they are local, and you have to ask someone local," he said. Wood siding, while considered aesthetically desirable, isn't the top choice in some parts of the country. Requiring regular painting or staining, especially in areas where the climate is not mild year round, it's also susceptible to damage by pests like termites, rodents, and birds. And it may succumb to rot and mold. In some areas, the possibility of fire damage makes wood siding untenable. Fiber cement siding is fireproof, termite-proof, and may have a warranty of up to fifty years. Charlene Meenan, a realtor in Glenbrook, Nevada, explains. "Our community opted to have the homeowners upgrade to fiber cement siding because it provides the highest return on investment, because we were constantly repainting the old siding, and because of the fire danger here. The homeowners association receives a discount on the fire insurance because of the siding and our defensible space program." Both vinyl siding and fiber cement siding have their positive features, but for some homeowners, it simply comes down to the bottom line. Fiber cement siding is more complicated to install than vinyl siding and so in addition to being a more expensive product, installation costs more. According to an article on vinyl siding installation costs published earlier this year, Home Siding: Where You Live Determines What You Pay, in Boston the average price of fiber cement installation is $9,690, whereas vinyl siding installation typically averages $7,590. 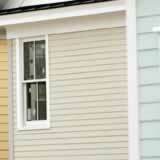 In New Orleans the figures are $5,572 for fiber cement siding installation, and $4,556 for vinyl siding installation. Those with historic or unique homes should be careful to choose siding that helps to maintain the special appearance of their property. "Homeowners in a historic property should select the appropriate materials to maintain the historic character of their properties," Jeff Carowitz of historic home preservation group Houston Mod explains. Sometimes this may not be the least expensive or most practical option. R. Howard of Houston Mod agrees, but is careful to explain that his private opinion may not be that of the organization. "I think fiber cement siding can look OK if it's installed as closely as possible to the original. Board and baton and slab plywood can be duplicated convincingly. I know an architect that used it on his historic modern house. I used it on my house. I think the industry needs to educate potential users of its proper installation. Improper installation of fiber cement siding devalues a house/building and may result in a building being further diminished and demolished." Brick may fit right in with historical structures. Made of fired clay, brick comes in a wide variety of earthy, eye-pleasing colors. However, brick siding is among the most expensive of siding options. In some areas, cheaper aluminum siding is acceptable, or practical vinyl siding is the norm. The durability and aesthetic advantages of fiber cement may not add to your home's value in these places. In other communities, however, lower grades of siding will not be welcomed and could put you at a disadvantage when trying to sell a home. A good local real estate agent or builder can help you make that determination.